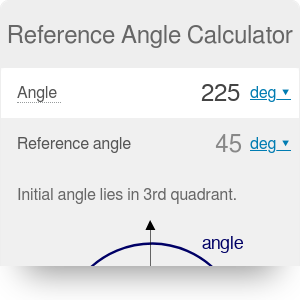 Our reference angle calculator is a handy tool for recalculating angles into their acute version. All you have to do is simply input any positive angle, and this calculator will find the reference angle for you. This article explains what a reference angle is, providing a reference angle definition. It will also show you a step-by-step instruction on how to find a reference angle in radians and degrees, along with a few examples. Keep scrolling, and you'll find a graph with quadrants as well! Look at the picture above. 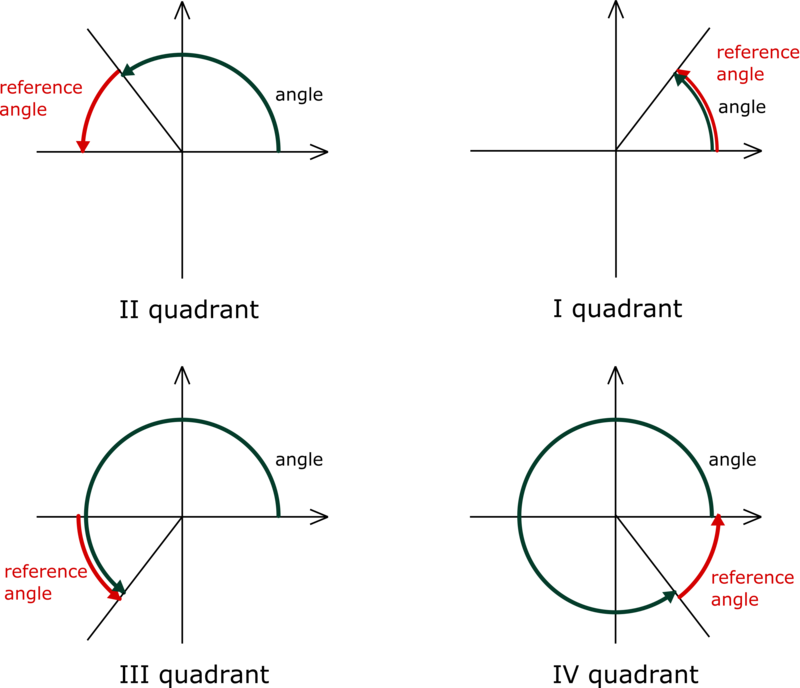 Every angle is measured from the positive part of the x-axis to its **terminal line** (the line that determines the end of the angle) counterclockwise. If you want to find the reference angle, you have to find the smallest possible angle formed by the x-axis and the terminal line, going either clockwise or counterclockwise. Reference angles are useful in trigonometry. If you want to find the sine or cosine of any arbitrary angle, you have first to look for its reference angle in the first quarter. Then, you can find the trigonometric function of the reference angle and choose a proper sign. Two axes of a 2D Cartesian system divide the plane into four infinite regions that are called quadrants. Numbering starts from the upper right quadrant, where both coordinates are positive, and goes in an anti-clockwise direction, as in the picture. Generally, trigonometric functions (sine, cosine, tangent, cotangent) give the same value for both an angle and its reference angle. The only thing that changes is the sign - these functions are positive and negative in various quadrants. Follow the "All Students Take Calculus" mnemonic rule (ASTC) to remember when these functions are positive. A for all: in the first quadrant, all trigonometric functions have positive values. S for sine: in the second quadrant, only the sine function has positive values. T for tangent: in the third quadrant, tangent and cotangent have positive values. 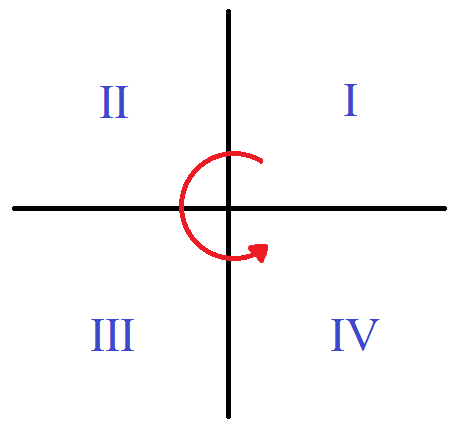 C for cosine: in the fourth quadrant, the cosine function has positive values. Make sure to take a look at our law of cosines calculator and law of sines calculator for more information about trigonometry. Choose your initial angle - for example, 610°. If your angle is larger than 360° (a full angle), subtract 360°. Keep doing it until you get an angle smaller than a full angle. In this example, after subtracting 360°, we get 250°. 270° to 360° - fourth quadrant. In this case, 250° lies in the third quadrant. 270° to 360°: reference angle = 360° - angle. In this case, we need to choose the formula reference angle = angle - 180°. reference angle = 250° - 180° = 70°. Choose your angle - for example, 28π/9. For angles larger than 2π, subtract the multiples of 2π, until a value smaller than full angle, as before. In our case, we're left with 10π/9. 3π/2 to 2π - fourth quadrant, so reference angle = 2π - angle. 10π/9 is a bit more than π, so it lays in the third quadrant. In this example, the reference angle is reference angle = angle - π = π/9. Type the angle into the box. It may be any positive angle you imagine, let's say we want to find the reference angle for 210°. If you want, you may also change the units, e.g., to radians. Here we go! This reference angle calculator found the acute version of your angle as well as the quadrant in which your initial angle lays. It's 30° in our case, and the initial angle lays in the third quadrant. Awesome! Reference Angle Calculator can be embedded on your website to enrich the content you wrote and make it easier for your visitors to understand your message.